The Most Accurate Meter Ever Built! The Spectra® Professional® IV-A # 18002-A is an Advanced Digital Exposure Meter (ADEM) for motion picture video and digital photography. This Internationally Acclaimed Industry Standard has received Technical Academy (OSCAR), Engineering Emmy and numerous international awards. The Spectra Professional IV-A is an Advanced and True Digital Exposure Meter. Compact and easy to use, it is the most comprehensive, technologically advanced and reliable exposure meter on the market today. The Spectra Professional IV-A measures incident and reflected light intensity directly in f/stops, footcandles or lux, and you can instantly calculate f/stop difference, contrast ratio, and the average of your particular lighting situation. This last feature is a Spectra exclusive. 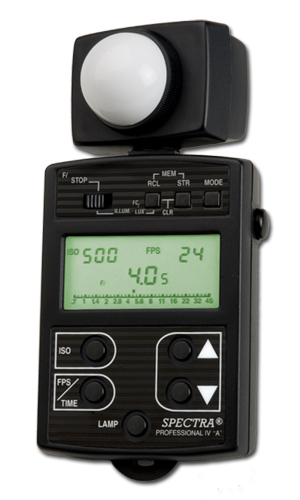 The Spectra Professional IV-A has a digital f/stop measuring range that extends from f/0.35 to f/128 in 1/10-stop increments and an Analog Bargraph with a range of f/0.7 to f/45 in 1/3-stop increments. Both are displayed simultaneously on a backlit liquid crystal display, along with film-speed, frames per second for cine and video use and exposure time for digital photography. The Spectra Professional IV-A is designed to measure highly accurate light intensity and covers illuminance levels from 0.1 to 70,000 footcandles and 1 to 100,000 lux, that is a sensitivity dynamic range of almost one million to one! Measures f/stop from f/0.35 to f/128, photographic illuminance from near total darkness- 0.1 footcandles to full 70,000 fc and 1 to 100,000 lux. The ratio of two readings from l:l to 999:1 can be instantly calculated and displayed thereby simplifying the set-up of any lighting situation. And, in f/stop mode, the difference in f/stop between a new reading and the last memorized measurement is displayed in precise 1/10 –stop increments up to plus or minus 12 f/stop. Average to two readings and/or continuous averaging in f/stop and footcandles are made possible. 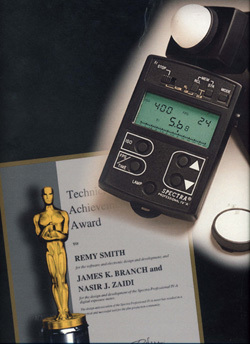 TYPE: Spectra Professional IV-A Advanced Digital Exposure Meter (ADEM) for measuring both incident and reflected light. Reflected light acceptance angle is 42 degrees-square. TECHNOLOGY: For highest accuracy and reliability it utilizes an advanced front end op amp, a custom sealed hybrid electronic circuitry, a multiple range linear circuit controlled by advanced mirco-computer and a custom liquid crystal display with aviation green backlit electro-luminescent lamps. LIGHT SENSOR: Silicon photovoltaic cell with computer selected glass filters tailored to the spectral response of the film. Swivel head assembly turns 270 degrees. MEASURING CAPABILITY: Direct readout of photographic exposures. Measure contrast ratios and average in f-stop. And in illuminance mode, measures illuminance level in footcandles (fc) and lux (lx). MEASURING RANGE: One million to one (20 f/stop) widest sensitivity range available. Digital f/stop: f/0.35 to f/128 in 1/10-stop increments. Analog f/0.7 to f/45 in 1/3-stop increments. PHOTOGRAPHIC ILLUMINANCE: Footcandles 0.1 to 70,000 and lux 1 to 100,000. CONTRAST RATIO: Calculates ratio of two readings: key plus fill to fill light alone, from 1:1 to 999:1. F/stop Difference: The difference in f/stop between a new reading and the last stored/memorized measurement is display in precise 1/10-stop increments up to plus or minus 12 f/stop. AVERAGING: Average of two readings and/or continuous averaging in f/stop and footcandles or lux. FRAMES PER SECOND: 2 TO 360 (for motion picture cameras). EXPOSURE TIME: 1/8000 sec to 30 minutes. RESOLUTION: Digital 0.1-stop; Analog 0.2-stop. ACCURACY: Digital 0.05 f/stop. Calibration is traceable to National Institute of Standard Technology (NIST) Washington, D.C.
ADDITIONAL FUNCTIONS: Memory Recall switch is a recall stored reading in memory (M1), second reading in memory (M2) and/or the ratio average and f/stop difference of the two readings. INSTANT RECALL OF ALL MEASUREMENTS AND CALCULATIONS: By pressing the recall (RCL) switch, the first stored/memorized reading (M1), the second stored/memorized reading (M2), contrast ratio or brightness (f/stop) difference, average footcandles/lux or average f/stop, can be recalled. IMMEDIATE UPDATE OF ALL EXPOSURE CALCULATIONS: If the film speed (ISO), frames per second/Cine (FPS) or exposure time/Still (TIME) settings are changed, the f/stops are immediately recalculated and displayed in normal, f/stop difference, or average modes. MEMORY ERASURE: You can erase the stored/memorized readings in memory (MI) and memory (M2) by pressing the store (STR) and recall (RCL) switch simultaneously. CAMERA SHUTTER ANGLE: Complete list of shutter angles and equivalent compensation table conveniently provided in the instructional material. BRIGHT GREEN DISPLAY: Electro-luminescent lamp for viewing displayed measurements at very low light levels. POWER SOURCE & CONSUMPTION: One 6 volt camera battery; No's A544, A544l, PX28l. 5mA/reading. Data Retention 5μA. BATTERY LIFE: Approximately one year with normal use. DIMENSIONS & WEIGHT: 5-1/2? X 2-1/2? X 2? ; Approximately 6 ounces. SPECTRA PROFESSIONAL IV-A MODEL # 18002-A SUPPLIED WITH: Photosphere (for ambient light), Photodisc (for key or directional light), Leather carrying case, Neck-strap, 6-volt battery, Instructional manual and warranty card. Two-year limited warranty included.